Thrifting has been a passion of mine for a little over 5 years now. I always tell people that it has to be the best thing that could have ever happened to my wardrobe, and even though I usually say it while laughing...I'm totally serious! Like many others, when my Granny suggested that I start thrifting while I was in high school, I thought that she was out of her mind. Why would I ever want to wear someone else's old/gross clothes? Now years later, every time I walk into a thrift store, it feels like I'm about to embark on a wonderful treasure hunt. I've been able to expand my wardrobe so widely throughout the years (maybe a little too widely), without spending hundreds and hundreds of dollars. Most importantly, it has helped me to establish my own original style by incorporating unique pieces representing several amazing decades. After you get over the initial hesitancy about thrifting, actually walk into a store and give it a chance! Of course just like anything, it isn't for everyone... but hey, how else will you know if you don't give it a try? As a newbie, -thrift, consignment, vintage, resale-, all of the different terms can easily make your head spin! 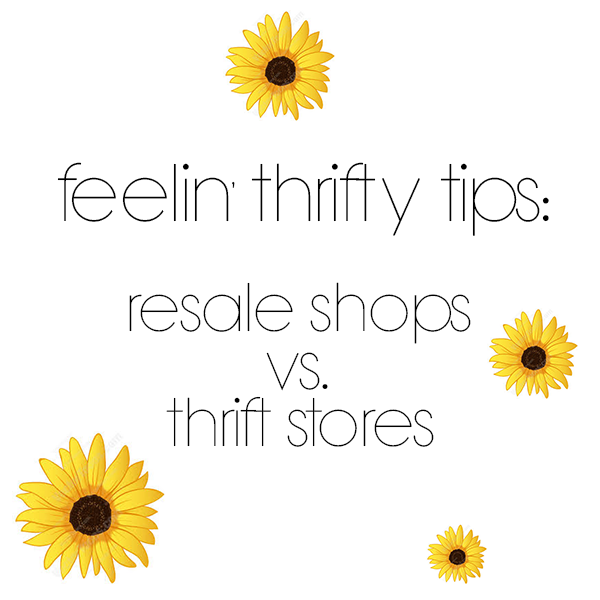 Therefore, for the first post of my new blog installment, Feelin' Thrifty Tips, I'm going to dive in on the differences between what I like to refer to as resale shops and thrift stores. I will definitely check out resale shops every now and then but I'd have to say that regular thrift stores will always be my preference. I don't mind digging in a bin or sorting through racks of old blouses to find a gem. Now, that may not be everyone's ideal shopping experience! Resale shopping can definitely take up a lot less of your time. You'll find things that are trendy and haven't been out of retail stores very long. On the other hand, if your look tends to be more retro, you should have no problem finding a cool blazer from the 90s at a thrift. Though, it is also very possible to find things to easily incorporate into a modern wardrobe as well. I personally believe that thrifters, vintage shoppers, consignment store enthusiasts...whatever you choose to call it, can enjoy both resale shops and thrift stores. Whenever you ride past any resale/thrift store and you have some time on your hands, just go inside and have some fun!